Fewer than 400 Minnesota public defenders will handle about 170,000 cases this year. That's more than double the caseload recommended by the American Bar Association. The workload has created tension. Earlier this year, public defenders in southeastern Minnesota filed a grievance, saying heavy caseloads put their licenses at risk. A judge recently threatened a Rochester public defender with contempt of court charges for missing a hearing -- when he was scheduled to be in court in two different counties at the same time. 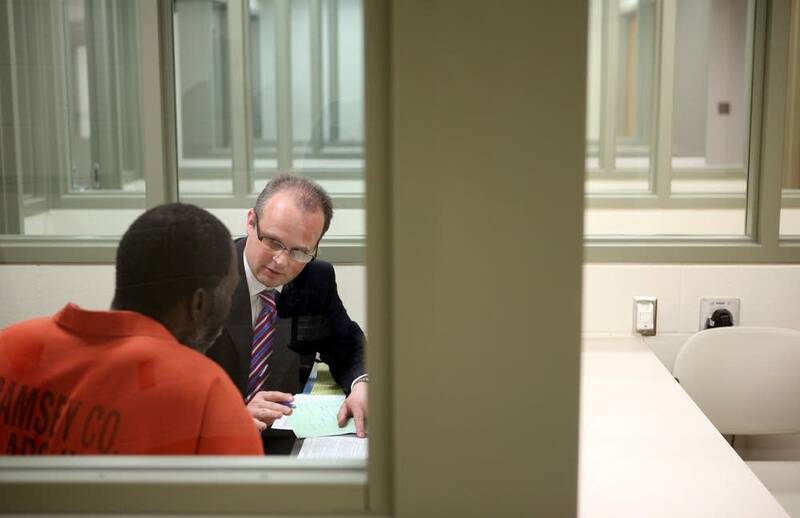 Following a public defender for a day in court quickly illustrates the problem. It's 1 p.m. Over the next three hours, Ramsey County public defender Erik Sandvick will argue the felony cases of 14 people before a judge. Today is their first chance to enter a plea of guilty or not guilty. "If you divide it out," Sandvick explains, "the 14 cases that I have set for today and the three hours that we have for court, it works out to be about 12 minutes per person." That 12 minutes doesn't allow for anything unexpected, or the time it takes for paperwork, research and other tasks. Sandvick left a more lucrative career in advertising about a decade ago to represent people too poor to pay for a private attorney. Paul Godfrey, Ramsey County Bar Assn. From the moment he enters the Ramsey County Law Enforcement Center, it's a race against time. Sandvick heads straight to the jail at the back of the courthouse. A guard leads him to a glass-enclosed meeting room and calls for Sandvick's next client. "Max Dakota?" the guard calls into the jail area, where dozens of defendants cluster around a heavy glass window. Dakota is wearing orange from head to toe -- burnt orange jumpsuit, matching orange socks and light orange flip flops. His shackles jangle as he shuffles into the room and takes a seat next to Sandvick. Sandvick wastes no time on pleasantries. "All right, Mr. Dakota, you remember me, my name is Erik Sandvick. I'm your attorney from the public defenders' office. We had a chance to meet last week while we were at jail," says Sandvick. Attorney and client hunch over a linoleum counter, going over the facts of 53-year-old Max Dakota's case. Dakota violated a no-contact order with his ex-girlfriend when he sent her an e-mail about their car's registration tabs. Since he had a prior criminal record, the violation landed him in jail. He's been behind bars for 15 days. This important meeting, which could potentially determine his future, lasts exactly six minutes. Dakota says he's been through court before, so he understands what is going on. But he worries about defendants new to the system, who rely on overworked public defenders to explain the law. "Sometimes there are individuals who walk away not quite understanding what is before them," Dakota says. "Eventually, they kind of catch up. But initially they are not quite always understanding what they are facing, unless, of course, they've been through the system numerous times. So they kind of get what I would call a street-grounded knowledge of what law is going to be like for them." With a loud clang of the jailhouse doors, the guard escorts Dakota out of the glass room and back into custody, where his orange jumpsuit disappears into the others. About an hour later, it's his turn for trial. He enters the courtroom through a back door and stands before Judge Rosanne Nathanson. "How does your client wish to proceed, Mr. Sandvick?" the judge asks him. Dakota pleads guilty. After about 20 minutes of questions and answers, the judge makes her ruling. She agrees to his request and releases Dakota from jail until sentencing. The judge reminds Dakota not to mess up again, and the trial is over. Sandvick rushes off to meet with his next client. Sandvick's busy calendar is mirrored by public defenders across the state. Ramsey County has cut more than a quarter of its attorneys since 2007, according to Pat Kittridge, chief public defender in the 2nd judicial district. They also have less to spend on investigators, support staff and witnesses. Kittridge said the public should be concerned about the overwhelming caseloads, because they threaten the quality of justice that low-income people receive. "People, generally, who go to prison almost all get out of prison," said Kittridge. "Clearly, if they feel they were treated fairly by the system and had an effective advocate, I believe their chances of recidivating are substantially reduced." The longer it takes cases to get through the system, the more taxpayers end up paying. Ramsey County Bar Association President Paul Godfrey said the courts need a stable source of funding to stem the crisis. He notes that some courts in Minnesota are already closed a half day every week to save money. If it gets worse, "we are going to start closing one day a week, and then two days a week, and your criminal trials are going to get pushed out, and your civil trials are going to get pushed out even farther." "The system is going to start backing up if we don't start funding the justice system -- not just the courts or the public defender or the county attorney," said Godfrey, who adds that he is not optimistic about the next state budget. Back in Ramsey County court, the clock is ticking. Court wraps up in an hour and a half, and public defender Erik Sandvick is a little out of breath. "I have about 11 more people that I need to talk with and meet with and appear with in court today," Sandvick says. This frenetic pace has become routine for him, but not for most of the low-income defendants whose fate partially rests in his hands. "The role of any good defense attorney is to make sure those charges are fair, and to make sure that all of our clients are zealously represented, and that it keeps the proverbial scales of justice in balance," Sandvick says. "And we try to do that every day." And with that, Sandvick has to go. It's time to prepare his next client for court.